Though there were a couple of negative reviews, I think this recipe is excellent. 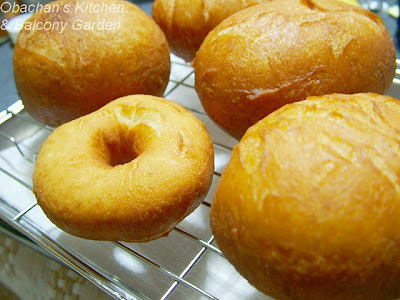 Funny, I had the urge to make Berliner (jam filled yeast donuts dusted with powdered sugar) this weekend. It's close to Fasching (Mardi Gras, Fat Tuesday, etc). When I was a student in Germany, the bakeries in Germany are usually filled with them around this time of year, sometimes really cheap if you buy them after four pm or so. So I had a craving. They look good! What did you fill them with? I like custard or red bean paste. Once I got a little crazy and mixed custard with red bean paste. Bliss! Oh, obachan! I wish you hadn't posted this picture -- I ended up grabbing doughnuts on my way home last night, you incited such a craving! I filled most of them with pastry cream. Custard with red bean paste sounds good. In fact I saw an anpan filled with custard, whipped cream and red bean paste the other day, so I don’t see why it shouldn’t be in doughnuts. Yep! And those plump ones were so crispy on the outside and creamy inside… Mmmmm..! !